Just starting your zero waste journey? Let me be the first to welcome to the community! It can be a little overwhelming when you’re trying to figure out where to start. These 10 tips will help you figure out those first beginner steps. If you feel like you’ve mastered the beginning steps, make sure to check out The Ultimate Step by Step Guide to Going Zero Waste. 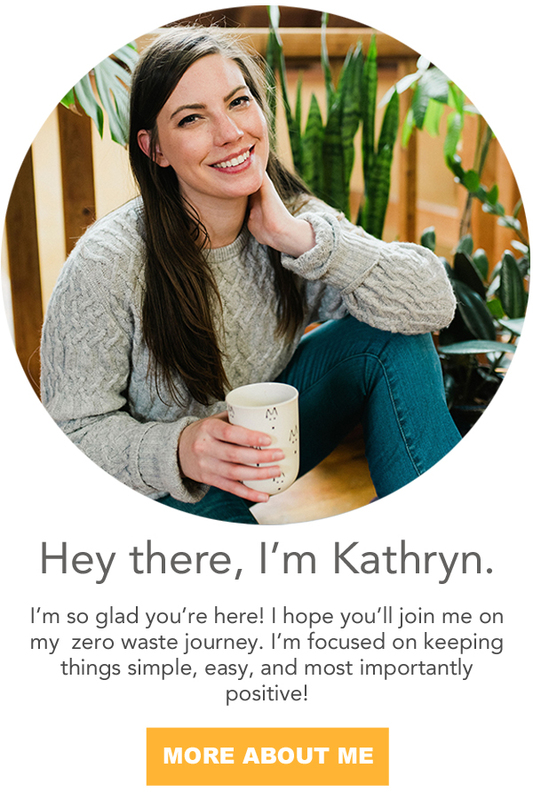 If you’re looking for more information, make sure to head to Zero Waste Tips for Beginners tab where all of my best beginner tips are rounded up in one easy and convenient location. What’s the reason you decided to go zero waste? Writing it down solidifies your resolve, giving you something to reference whenever you need motivation. Perhaps it’s because you deeply care for the environment, want to save money, or avoid the toxins found in plastics. All those reasons are valid. Reference this ‘why’ whenever you need some inspiration, or when the going gets tough. You got this! Waste is everywhere, so before you overburden yourself focus on cutting out single use items. What do you find yourself reaching for most: Plastic utensils, paper napkins, plastic water bottles? Feel free to observe yourself for one week and take a trash audit. This will really help you see where your waste is coming from, and what exactly to eliminate. If you’re not ready to tackle a trash audit, here are top 10 zero waste swaps to get you started. You don’t have to buy new items to be zero waste. Look around your house: What zero waste tools do you already have? Empty glass jars are great for storing dry bulk foods, homemade treats, leftovers, composting on the go, or an impromptu water bottle. For more inspiration check out 13 unexpected ways to use a mason jar. An old shirt can be made into a reusable produce bag, or cut up into hankies or rags. Reusable cutlery in your kitchen can be used for to-go utensils. You don’t have to go out and buy all new stuff - just get creative! My friend Celia from LITTERLESS has an awesome series called Nothing New talking all about using what you already own. As a bonus, it’s also much cheaper. Make sure to grab my tips for Going Zero Waste on a Budget! When you do have to buy an item, check your local thrift stores first. They might just have what you need (at a much lower price too). And, be sure to check out this super helpful blog post 5 Places to Find Zero Waste Supplies. Items in thrift stores have already been made, so new resources do not need to be wasted on creating them. You’re also keeping a perfectly good item out of a landfill. If you can’t find what you’re looking for secondhand, check out the zero waste shop where you can find all of the products used to make zero waste living just a little bit easier. When you see an item you like or want, ask yourself if you really need it. Step away from the item and wait a few days (I recommend 30!). This will allow you to avoid overconsumption. If there’s something you need, always ask friends and family first before buying it. For example, did your coffee machine just break? Ask your sister if she has a spare. This will help save you a buck and not waste any new resources. Most toiletries, makeup, and processed food items are packaged in plastic. You can greatly reduce this kind of waste by learning how to make things yourself. Skip the takeout and make a homemade meal for dinner! (Of course there’s zero waste takeout too….) Swap out conventional toothpaste for zero waste toothpaste or mouthwash. Learn how to make your own nut butters and cashew milk. Your community can help you achieve so much. It’s a great way to get friends, family, and neighbors involved in reducing their trash. You’ll be able to see an awesome local impact! Support your local bulk food store, farmers market, and/or community garden. Get involved with local government and talk all things zero waste. Plan a clothing swap or host a cleanup. Whether it be online or with friends and family, having a support group matters. These are the people you can talk all things zero waste about. If you live with your parents, or have a family, get them involved! Get 10 tips for going zero waste while still living at home, and explain the zero waste movement and why it matters to you and see if they’d be open to participating. To get them pumped, try doing a 31 day challenge together. It’s a fun, interactive way to peak their interest. Our society is quick to throw things out when something breaks or stops working. Challenge consumerism by developing a relationship with your items. Purchasing products built to last will also save you money in the long run. If something breaks, take the time to repair it or repurpose it. If you treat your items with care, chances are they’ll last a lot longer too. Composting is AWESOME for the environment. Give it a go by placing all your food scraps into a jar and putting them in the freezer. Then, just dump the scraps off at your local food scrap drop off location. If you have a backyard, invest in a tumbler: All you have to do is add your food scraps and give it a crank. In no time, you’ll have fresh, nutrient dense compost. Check out the guides for composting in your backyard and composting in an apartment. Are you just starting out on your zero waste journey? Did you find the above guide useful? Give it a share to inspire friends and family to show them how easy it is to get started! Guest Post: Ariana Palmieri is the founder of Greenify-Me.com, a blog dedicated to zero waste living and sustainability. Her work has been featured on MindBodyGreen, Green Matters, The Penny Hoarder and several other publications. Get her free e-book "10 Ways to Reduce Trash" by signing up to her newsletter and learn how to reduce your waste today.